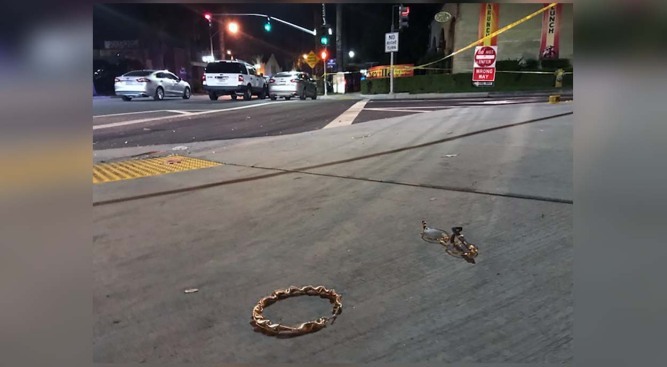 Glasses, a bracelet and other items were scattered on the ground outside a Riverside nightclub after a shooting early Monday Oct. 29, 2018. Seven people at a Riverside nightclub Halloween party were wounded in a shooting early Monday. Gunfire was reported around at the Sevilla Nightclub at 3252 Mission Inn Ave., the site of a party based on "The Purge" horror film and TV series. Officers found two victims with gunshot wounds who were taken to hospitals for treatment, police said. Another five people showed up at hospitals for treatment of what police termed "gunshot injuries" suffered at the Southern California nightclub. The club was blocked off by yellow crime scene tape early Monday. Witnesses described a chaotic scene. "It was like ten in a row," a witnesses said of the rapid gunfire. "People were falling, and there were people right by the door just taking chains and wallets and phones." The initial investigation indicates there was an altercation inside the club that led to the shooting. Information regarding the shooter and a possible motive were not immediately available. Police recovered several bullet casings of different calibers. More than one person might have opened fire, police said. Anyone with information can call police at 951-353-7130 or 951-353-7134. Tips also can be submitted to rpdtips@riversideca.gov.